Below is our featured pastor's testimonial who has received help through Praise International. 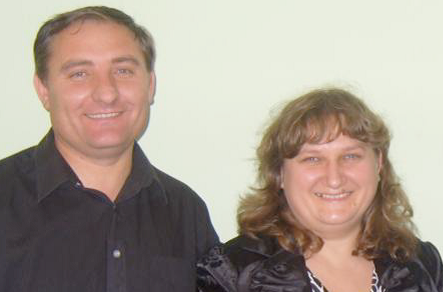 Praise International facilitates the ministry of Moldovan pastor Petru Chirica and his wife Antonina. Praise International is committed to supporting and equipping national pastors in poverty-stricken countries. Moldova is one of Europe's poorest countries. Moldovans who live in the rural regions are the poorest of the poor. Pastor Petru is a perfect example of the kinds of support we can offer. He is pastor of a church in the remote village of Strãseni. At the same time, he is Director of Charity Mission for the Disabled of Moldova, a nation-wide Christian ministry for the estimated 300,000 disabled children and adults in Moldova. This ministry was actually founded by Sergui Rutcovschi, our Praise National Leader.This ministry offers many helpful programs year-round, including summer camps. Pastor Petru provides the Bible teaching for these. The three camps this summer had a total of 350 campers. Several of whom accepted the Lord. Pastor, director and, as if this weren't enough, Petru is also business owner. Most, if not all, of his church members live in abject poverty. His salary as pastor and director didn't even come near to what he needed to provide for his family. He had the idea to start a commercial rabbit meat farm. He prepared and presented an excellent business plan to Praise International, requesting a microloan get this business started. He is now able to provide for his family and he is also able at times to help others. Pastor, director, business owner, husband and father. One of their children has down-syndrome. Join Praise International and cover Pastor Petru and Antonina Chirica with your prayers.